Heather Fyke, originally from Moosomin, will be honored at the Sunset Ceremony at the RCMP Depot Division in Regina on Canada Day. As a civilian employee at the RCMP’s Communications Centre, she was involved in the initial response to the Humboldt Broncos bus tragedy. She is being recognized for her contribution to critical incident stress management within the RCMP. A former Moosomin resident who played a role in the response to the Humboldt Broncos bus tragedy will be honored at the RCMP Sunset Ceremony on Canada Day at the RCMP training academy in Regina. Fyke works in the communications centre doing the call taking and dispatching for the Saskatchewan RCMP. She says the honor came as a surprise to her. “I’ve never been part of a Sunset Ceremony before, but usually they have special dignitaries that sit in a special part of the parade square, and when the cadets are done their parade they walk by and salute all the dignitaries, and I will be sitting with all the dignitaries. Fyke says she has taken it to task to make sure the mental health of her co-workers and members of the RCMP is looked after. “For our office for Christmas I did a Secret Santa and made everybody homemade wooden nickels to commemorate their years of service, and it was just a little thank you. We don’t get a lot of thanks from the public, we usually talk to them when they are quite upset, so to get a little memento from somebody, it doesn’t matter who, it’s kind of nice for us. “I’m also part of the CISM group. I do critical incident stress debriefings, diffusings as well as resiliency meetings. “It’s ironic that this came at the time that it did because I went off work for a little while after the Humboldt accident. That kind of kicked me pretty hard. For me it was a good reminder that this is how I need to take care of myself and I have so many more tools to take care of those people around me now. “I was the primary dispatcher (during the bus accident). My team was working, so we took all the first calls and we sent out the first wave of members and did all the contacts for all the other resources that we needed. The tragedy of that accident was that there were two teams involved. Usually we just have one team that takes care of it, but because it was right around shift change we had two full teams that were exposed to not only the accident, but the aftermath of talking to the families calling in and asking about their loved ones. Fyke says it’s a huge honor for her to be a guest at the Sunset Ceremony. “It’s huge, it’s absolutely huge. We do so much behind the scenes, to actually be recognized for that is nice,” she says. “I was told I could bring a guest and I am actually bringing a coworker that I feel has been passed by in a lot of awards. Every member in Saskatchewan knows her name, so I am asking her to stand by me with this. It’s a way for me to pay it forward too and recognize her for her contribution. The Sunset Ceremony takes place at the Depot Division on Dewdney Avenue West in Regina. Doors open at 5:30 pm. and the ceremony starts at 6:45 pm. 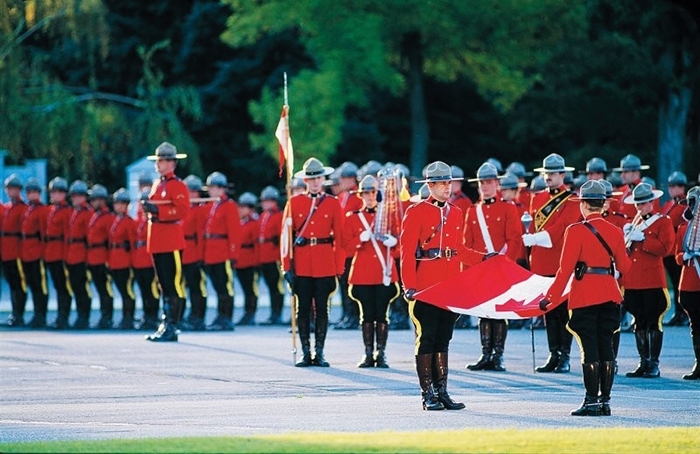 The Sunset Ceremony lasts approximately 45 minutes and includes military music, the lowering of the Canadian flag, the March Past, and a troop drill display performed by cadets dressed in the RCMP’s scarlet tunic. Visitors are invited to meet the riders, horses and Safety Bear following the ceremony. Parking is available at the RCMP Heritage Centre at 5907 Dewdney Avenue. Cadets in period costumes will direct guests from the parking lot to the best viewing areas.